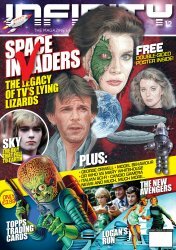 From the publishers of The Dark Side in the United Kingdom comes INFINITY, a magazine dedicated to sci-fi and fantasy. This is Issue #13, featuring Princess of the Amazons: The Wonders of Wonder Woman! - Beware! The Tripods are Here! Glossy full color 66 pages. Copyright 2018 Ghoulish Publishing. Collectors Note: Brand-new and uncirculated. Received directly from the publisher in the UK. We'll pick the best condition magazine first come, first served. Missed Issue #12? Use the convenient Buy Both button below! INFINITY #12 - Space Invaders TV's Lying Lizards - Logan's Run!